This post was written by peterjmurray on October 26th, 2014 11:13 am Comments Off on JEWELS OF THE SOUTH! It was just great after the hectic start to the term to head back to our fab Berkshire retreat to have a little well-earned R&R. But not for long! After losing myself in the Enbourne Valley, fishing, running and cycling…it was back into schools to talk about our books and to inspire pupils to use their amazing imaginations! First stop was Mortimer St Mary – our second visit. But this time to work with Year 6’s on ‘How to write a seriously scary short story’ (try saying that!). 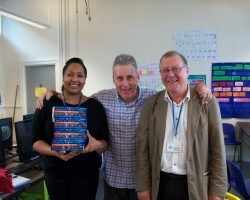 The Year 6’s were great to work with and the next day saw almost every one of them lined up to get a signed copy of my short-story collection ‘Ten O’ Clock Caller’. We are returning once again to this brilliant school to perform our Bonebreaker Presentation just prior to Christmas. Can’t wait! It will be nice to have another excuse to meet up with our good friend, Carole Ockerby – we used to teach together at Cheam. Carole now teaches part-time at Mortimer St Mary – see you again soon, Carole! Another wonderful (but exhausting!) 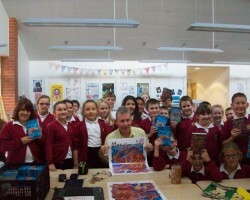 day followed back at Park House School in Newbury. A big presentation to the Year 7’s followed by lots of workshops. The students were more than keen to join in with everything and Jane Stewart, the librarian, proved yet again a fab host, constantly keeping us supplied with tea, coffee and biscuits throughout the day…a big ‘thank you’ to all at Park House for giving us such a fulfilling day! The next visit was VERY special…back to where the whole author thing started ten years ago – Cheam School, where I taught for 15 years! 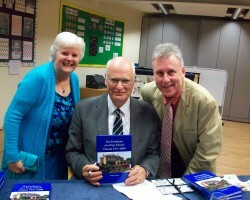 And the first event was a book-launch by a rival author! Our close friend, Richard Moore, had completed his wonderful book on the evolution of Cheam throughout his long career spanning over 30 years. The book paints an amazing portrait of events following the lives of headteachers and staff who lived and worked there – much of my own life I have to say. It was so refreshing for me to be on the other side of the author’s desk waiting to have my copy signed. I felt distinctly nervous! And during my own event, it seemed more than strange to take to the stage in front of an audience where none of the pupils knew me (Years 3 to 5), but they certainly took to the Mokee Joe presentation and were more than fired up when we left. Of course, my biggest adult fan at the school, Jane Johnson, was there at the back of the packed auditorium, hanging on every word! Thanks, Jane, you are such an inspiration for me to carry on writing! Bonebreaker Trilogy formed the basis of the presentations, followed up by the spooky, scary Scabbajack. 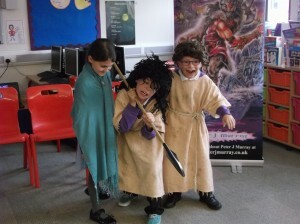 Much to their disgust, we decided to leave the Year 3’s out from part two of the presentation – we thought the Dawn Demons, Moonwailer and Scabbajack novels might prove a bit too much for them, especially when their imaginations kicked in at night! I wonder just how many of our readers have a little peek under the bed before they go to sleep??? 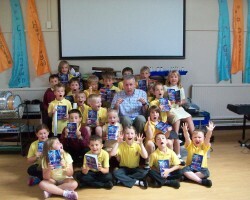 One poor teacher at Hurst Lodge wished he’d not looked under the bed after reading Moonwailer! You can see what happened to him in the pic – I didn’t even know that werewolves hid under the bed! Great follow-up work from Winchcombe fans! Final school for us before the half-term break was a real bonus – Winchcombe School in Newbury. I checked my diary and found an entry of September 2003 to show that this was one of my very first school visits all those years ago. I have to say that our present-day audience proved very special – they were magnificent in the way they interacted and threw themselves into everything with complete enthusiasm. I will never forget little Chelsea having fits of laughter as I chased her in my Mokee Joe costume – fab fun…as scary things should be! Kath and I were also humbled in seeing the mass of follow-up work the next day by some of the children – Brilliant! Well…that’s about all for now. So much more I could have written, but I’ve got a couple of new books to get on with. Just left to wish EVERYONE that we’ve worked with over the last half-term a wonderful break and a happy and eventful Halloween…remember….scary should be fun! Enjoy! 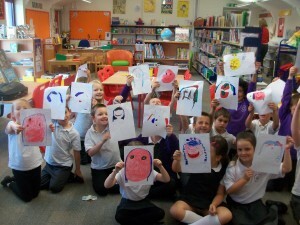 Saxon heroes at Northfield St Nicholas! Kath and I followed our fab time in South Wales with an equally fab time in deepest Norfolk/Suffolk – the setting for one of my most successful books, ‘Bonebreaker’. We started our week with a visit to a small school which boasts of being the most easterly primary school in the country – Corton Primary. Sure enough, we found this attractive little school located almost on the beach! We thoroughly enjoyed entertaining the 60 or so KS2 pupils with our spooky Mokee Joe presentation and signed lots of books the next day. And little did we know that our friend, Richard, of Renaissance Learning, was a grandparent of one of our new Corton fans. It was good to catch up with him and sign all five Mokee Joe books for his lovely granddaughter. A second school visit found us in the very centre of one of my most favourite seaside towns…St Nicholas’ Priory Juniors in Great Yarmouth. This school was a little bit bigger with around 350 pupils, but the Mokee Joe presentation still went down a storm! As I always say – the bigger the audience the bigger the buzz! Brilliant! We loved our visit there and found all of the staff and pupils VERY welcoming! We’re already planning to return next year to perform our very appropriate ‘Bonebreaker’ presentation. The hero of the book, Billy Hardacre, even visits Great Yarmouth town centre in the story. Two days followed in a school that has almost adopted us (and our son, Simon) – the wonderful Northfield St Nicholas School near Lowestoft. We’ve made a really good friend there…the librarian and excellent hostess, Ms Gulliver (Julie to us!). 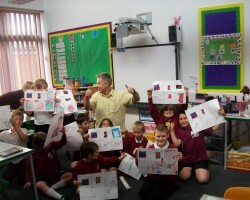 We worked very hard in this school, presenting and carrying out workshops with all eight classes. Hard work but VERY rewarding, as all of the pupils without exception, worked with us and made for a very enjoyable experience during our time there. Thank you so much to everyone. Hope you liked the flowers Ms Gulliver. Final visit of the week was to a new school to us…St Margaret’s Primary, just down the road from Northfield St Nicholas. We opened the upgraded library there and signed a few books. We only just managed to squeeze this visit in, but intend to return next year to perform a full presentation for the KS2 pupils. The lovely librarian, Lesley, looked after us…thank you and see you again soon! …Oh, by the way, they say Johnny Depp lives near to where we were staying and often pops into the local pub just up the road…but guess what…we never saw him! 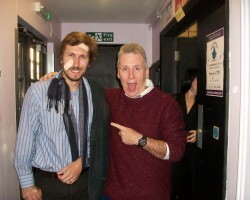 It’s a pity, because I would have given him my autograph. Every one of the schools we visited in the Abertawe district (Swansea for non-Welsh speaking folk) provided a memorable experience for Kath and I. 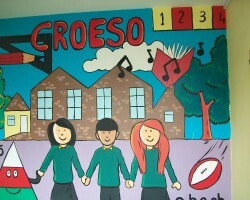 We began our two-week tour at Mr Schofield’s Bryn Y Mor school – our second visit. We entertained his lovely pupils with our dramatic Bonebreaker presentation. They were more than ‘up for it’ and we signed loads of books the next day. We owe much to Mr Schofield and his wife, Catherine, and his lovely family, for hosting us and looking after us so well. We were even invited to their home for a slap-up Louisiana feast to remind us of our time in New Orleans- and their recent holiday there. Further visits that week were to Tirdeunaw, Saron (Mrs Schofield’s school) and Bryniago – all superb visits. A huge thank-you to all pupils and staff for making us so welcome. To add to the wonderful week, we chose to stay at the nearby White Springs Fishery in a luxury log cabin, surrounded by eight fishing lakes. I really felt I was in paradise and took every opportunity to fish in the evenings, catching loads of fish…but feeling more and more exhausted as the week went on. Who said fishing is relaxing? No way! At least not when your float is continually bobbing up and down! The following week we move to the quaint seaside town of Mumbles – love the name! A second visit to Log in Fach and another Bonebreaker presentation succeeded in enthusing and entertaining Undeg’s wonderful school! We always feel really at home here and we’re already looking forward to being back again next year! Two new schools followed – Pontybrenin and Llwynderw – both welcome additions to our list of South Wales schools that we intend to keep working with. We introduced our ‘new schools’ to Mokee Joe and this made the whole trip much more enjoyable for us as we offered varying presentations from day to day. We found our accommodation in Mumbles extremely pleasant – Beach Mount Cottage in Church Lane – a very old property with loads of character. Did I hear a creak on the wooden stairs one night? And I’m sure I caught a glimpse of something in the huge mirror in the sitting room late one evening…and it wasn’t me…or Kath!! Oh…and I must mention ‘the great ice-cream debate’! After a rigorous survey over the week, Kath and I decided we liked the taste of Joe’s Ice Cream Parlour’s offerings the best, but Verdi’s won over the location and setting. Can’t wait to get back again to see if things have changed. I think another survey might me necessary! THANKS AGAIN, SOUTH WALES…WE LOVE YOU ALL…HOPE YOU ENJOY THE BOOKS AND KEEP IN TOUCH!